Joe Frazier, 20th Century heavyweight boxing champion, is principally known for his rivalry with fellow boxer Muhammad Ali. Frazier was born on January 12, 1944 in Beaufort County, South Carolina. One of eleven children, he moved to New York when he was 15 years old to live with an older brother. Unable to find work, he relocated to Philadelphia, Pennsylvania, where he took up boxing to lose weight in late 1961. Exhibiting a knack for the game, Frazier began boxing as an amateur, and reigned as the Middle Atlantic Golden Gloves heavyweight champion for three straight years. Hoping to make the 1964 U.S. Olympic team, he lost to Buster Mathis in the finals of the Olympic Trials, but was subsequently named the heavyweight representative when Mathis injured his hand. Frazier won a gold medal by defeating the German heavyweight. Joe Frazier made his professional debut on August 16, 1965. Always on the attack, utilizing a bob-and-weave style, he was relentless in his approach, and had a devastating left hook. After going undefeated in his first 20 bouts, Frazier was granted a shot at Buster Mathis for the New York heavyweight title on March 4, 1968. He stopped Mathis in the 11th round. He defeated his next six opponents before becoming the undisputed heavyweight champion of the world by virtue of a five-round technical knockout over WBA champion Jimmy Ellis on February 16, 1970. 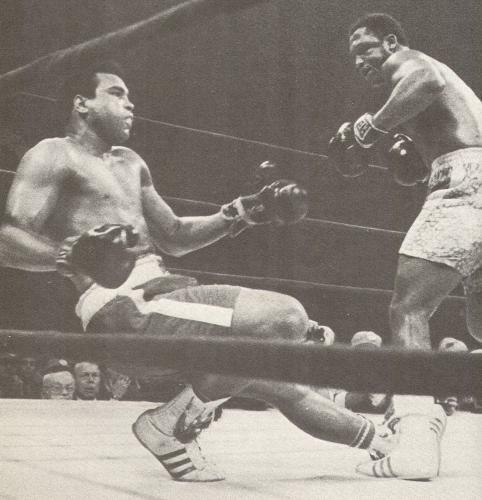 On March 8, 1971, Frazier faced off against Muhammad Ali in the “Fight of the Century” at Madison Square Garden. Ali had been stripped of the heavyweight title in the spring of 1967 for refusing to enter the U.S. Army. Frazier knocked Ali down in the 15th round with a left hook and earned a unanimous decision from the three judges at ringside. It was the first defeat of Ali’s career. Frazier lost the title to George Foreman in January of 1973. Foreman knocked him down six times before the fight was stopped in the 2nd round. Ali subsequently upset Foreman to recapture the heavyweight title, and he and Frazier were matched to fight in Madison Square Garden for a second time on January 28, 1974. Ali emerged with the decision, though Frazier and a number of sportswriters in attendance felt he had earned the victory. The pair met a third time on October 1, 1975 in the Philippines in an epic battle dubbed “The Thrilla in Manila.” Both men absorbed tremendous punishment, but Frazier suffered a 14th round knockout when his trainer refused to let him continue because his eyes were nearly swollen shut. Frazier retired in December of 1981 with an overall record of 32 wins, 4 losses, and 1 draw. He was inducted into the International Boxing Hall of Fame in 1990. Joe Frazier died in Philadephia on November 7, 2011 of liver cancer. He was 67. Joe Frazier and Phil Berger, Smokin’ Joe: The Autobiography of a Heavyweight Champion of the World, Smokin’ Joe Frazier (New York, N.Y.: MacMillan Publishing Co. 1996); www.boxrec.com.